I am staying in Angeles. Wait! I have a question. Can it be? or Is it possible? Heh! E da na ka kasabi. E da na ka paksabyan mambus kapilan man! I will never talk to you again! I will buy a vetsin. I will just use the restroom. I will ride a jeep. E ka mangargabyiadung kaparamung tawu. A lingua franca or working language is a language used to make communication possible between people not sharing a common language. For example, a Czech may converse to a Sudanese in English so that they may understand each other or a Senegalese will converse to a Frenchman in French so that they may understand one another. Examples of lingua franca include French, Chinese, Hindi-Urdu, Spanish, Arabic, Russian, and English. Before we discuss the lingua franca used in the Philippines, let us first give you a background of the languages used in the Philippines. Philippines is a country situated southeast of China, composing of more or less 7,107 islands as well as plenty of mountain ranges and volcanoes. Because of this geography, no wonder each group of people that settled in the different parts of the country developed its own ethnicity and language or dialect over the course of centuries. No wonder, Filipinos do not understand one another and have to use English, Filipino or other regional language just to communicate. For example, a Cebuano has to speak in English or Filipino to an Ilocano in order for them to communicate. Currently, there are about 120 or 175 different languages or dialects spoken in the islands depending on the method of classification you used. Most are related but not mutually intelligible. Most also belong to the Austronesian family of languages and as such are related to the languages and dialects spoken in nearby Malaysia and Indonesia. The top six most commonly used languages are Tagalog, Cebuano, Ilocano, Hiligaynon, Waray-Waray, and Kapampangan. There are currently two official languages in the Philippines: English and Filipino. 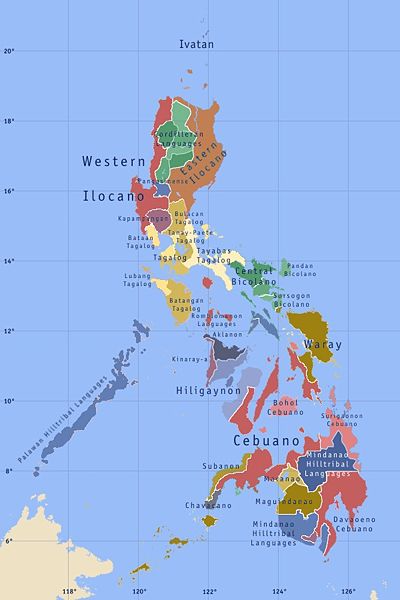 During Pre-Hispanic times, the lingua franca used in the islands that will eventually become the Philippines is Malay or Old Malay which is different from the one spoken in modern-day Malaysia. The language of trade is Malay and this is evidenced by the fact that when Ferdinand Magellan came to the Philippines, his Malay slave, Enrique conversed to the natives in his own tongue, which was a sign that he reached the Far East. When the Spaniards finally established the Philippines in 1565, Spanish gradually became the lingua franca in the islands. It was during this period of Spanish rule that the native languages gradually became Hispanized or influenced by Spanish. A lot of words were borrowed from Spanish and today one will be surprised of the many similarities between Spanish and the languages spoken in the Philippines. The reason why Spanish never replaced the different languages or dialects in the country is because of the climate and distance of the former colony. The climate is so hot that most Spaniards never permanently settled in the islands. The length of travel was so long it will take months or almost a year just to reach the islands either you travel by way of Mexico and then the Pacific or around the southern tip of Africa and across the Indian Ocean. This was true especially during the days before the Suez Canal was constructed and ships had to rely on the wind for power. Most Spaniards that stay in the country are either government employees or clergymen and so once their duty was accomplished, they return to their mother country. The missionaries also contributed to the preservation of the native languages by publishing dictionaries of the native languages. By the time the Spaniards left in 1898, Spanish was mutually understood by most people in the country well into the first half of the 20th century wherein it fell into gradual decline thereafter. Finally it ceased to function as an official language in 1987. Nowadays, very few people used it as a language with most of them Spanish Filipino living in the capital. English gradually replaced Spanish as the working language in the country when the Americans replaced the Spaniards as the master of the islands after the brief Spanish-American War (1898). With the introduction of the American public school system, English quickly replaced Spanish as the medium of instruction and it was not long that most Filipinos have an understanding of the new language. The Americans eventually granted the Philippines independence on July 4, 1946 and it was after this date that English will eventually become the language of education, business, trade, law, medicine, and technology in the country. 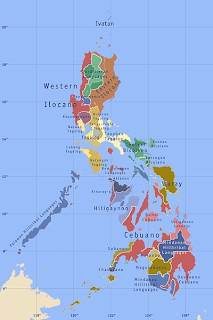 Today, the Philippines is the third largest English-speaking nation. Because most Filipinos have a good command of English even though it is just their second language, the Philippines is now the world’s center for business process outsourcing and a lot of call center companies have established themselves in the country. While English was busy establishing itself in the islands, another language was established as another lingua franca or official language in the archipelago alongside English and Spanish. However, this time it was based on the language used in the capital Manila which was Tagalog much like modern English was based on the dialect used in London. Tagalog was chosen as the base language on the 20th of December 1937. In 1939, President Manuel Luis Quezón renamed the Tagalog language as Wikang Pambansa or the national language. The language was further renamed in 1959 as Pilipino by Secretary of Education Jose Romero. The 1973 constitution declared the Pilipino language to be co-official, along with English, and mandated the development of a national language, to be known as Filipino. In other words, Filipino and Tagalog are one and the same. The present constitution, ratified in 1987, stated that Filipino and English are both the official languages of the country. The constitution also made mention of Spanish and Arabic, both of which are to be promoted on a voluntary and optional basis. Filipino is an official language of education, but less important than English. It is the major language of the broadcast media and cinema, but less important than English as a language of publication (except in some domains, like comic books, which are meant to speak directly to the Filipino psyche) and less important for academic-scientific-technological discourse. Filipino is used as a lingua franca in all regions of the Philippines as well as within overseas Filipino communities. While Filipino is used as a means of communication between Filipinos of different ethnicities, there are other regional languages as well. Regional languages are a lingua franca in their own right but instead of being used in the whole country, they are only used in one region of the country. 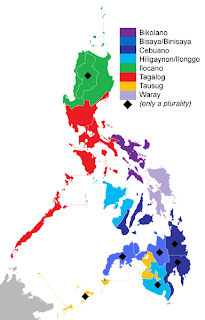 Examples of regional languages in the Philippines include Cebuano, Hiligayon, Kapampangan, Ilocano and Chavacano. Pictures and some statements courtesy of Wikipedia. Answer: No. Because it may have extensively borrowed words from Spanish but its grammar is still Malayo-Polynesian. For example, tienda becomes tindahan. Caballo becomes kabayo and nangangabayo as a verb in the present tense. It is like saying English should become a part of the Romance languages because of its extensive borrowings from French. English should and shall still remain a part of the Germanic languages even though it extensively borrowed words from French. It should be better stated that Filipino as well as the other languages or dialects spoken in the Philippines should be recognized as Hipanized Austronesian or Latinized Austronesian. Paras is a family name common in the province of Pampanga, Philippines. In the Philippines, it simply means spicy in the Tagalog and Kapampangan language while in the Cebuano language, a similar term is “paras-paras” meaning rowdy, rough or brawler. However, it has other meanings in other languages too. For example, in Sanskrit, Gujarati or Hindu it means a stone that converts iron or any metal into gold or it also means, "A diamond on top of the snake that is around god Shiva's neck and if this diamond touches something, it turns it into gold.” In short, it means touchstone. In English, it is the shortened term for paratroopers. In Serbia it means a monetary unit equal to one hundredth of a Serbian dinar. For Pokémon aficionados, Paras is a very crablike, six-legged Pokémon with two mushrooms on its back that has the ability to incapacitate its enemies. Benjie Paras - is a Filipino actor and a former professional basketball player of the Philippine Basketball Association (PBA). He is the only PBA player to win both Rookie of the Year and Most Valuable Player honors, in a single season (1989). Father Macario Paras - the first parish priest of Holy Rosary Parish(1829 – 1842) in Angeles City, Philippines. He founded the veneration of the Dead Christ or Holy Sepulcher in the province which still thrives until this day.